We’d love your help. Let us know what’s wrong with this preview of Uninvited by Leah Spiegel. To ask other readers questions about Uninvited, please sign up. This was an interesting mystery story, even if these girls weren’t the best detectives. I liked the characters in this book, even if Val was ridiculously accident prone, and they all made mistakes at points. I found Shane’s character to be a bit weird though, as it seemed a little odd that he was pretending to be a high school student. The storyline in this was alright, and I didn’t guess who had kidnapped Kirsten. I was a little surprised when it was revealed exactly what had been going on, and I thought the story was enjoyable overall. I have to say that I really wanted to like this book. It sounded like a good book. Unfortunately, it just wasn't for me. Alley is a high school senior who hangs out with a bunch of rich girls, even though she isn't really "one of them." Her BFF, Val is a total klutz and a lot of the book is spent describing Val falling down. Seriously, it was like every other page. Anyways, Alley, Val, Libby, Kayla, and Kirsten make up their little group. Ki I received this book in exchange for an honest review. I have to say that I really wanted to like this book. It sounded like a good book. Unfortunately, it just wasn't for me. Alley is a high school senior who hangs out with a bunch of rich girls, even though she isn't really "one of them." Her BFF, Val is a total klutz and a lot of the book is spent describing Val falling down. Seriously, it was like every other page. Anyways, Alley, Val, Libby, Kayla, and Kirsten make up their little group. Kirsten is throwing a Sweet 18 party and asks the other girls to go with her to a dress fitting for the party, but she doesn't show. Around that time, a new guy, Shane, shows up, and seems to know Kirsten pretty well already. So, Kirsten goes missing, and the majority of the book is spent with Val leading the remaining four of the group to "find" Kirsten. The plot wasn't terrible, it just wasn't very good. I found myself confused often, and I didn't really like the way it flowed. It also bugged me that there was a lot of backstory stuff that was wound through it, but we were never really told about it. All four girls bugged the crap out of me. Alley was kinda stupid and just did whatever Val did, in the name of keeping Val safe, but was really just putting herself in danger. Val was just annoying. If we went to school together, we would not get along. Libby was obnoxious. She was mean and snotty all the time and it just bugged me. I do want to say that I felt kinda bad for her, because her friends constantly made fun of her for being so skinny, but I think she really was anorexic and it just really bothered me. I don't really think Kayla had a purpose in the book. I feel like everything could really have been better if it was just Val and Alley, but then that would make it a lot like Hush, Hush (you know with Vee and Nora "investigating" Patch?). Except our Patch would be Shane here. I did like Shane. He was funny and witty and kinda nice and cute and all that, but I never got attached to him. Honestly, I never really got attached to any of the characters. Uninvited was a pretty awesome read! The book doesn't take itself too seriously yet I was still intrigued by the story and mystery. It was even more enjoyable after reading a few darker reads beforehand. I gobbled this light book up, even though I am not always one for the genre. I would recommend Uninvited to anybody looking for a reading vacation. I really enjoyed Ally's narration. For the most part, she is very likable, and very vivid. I have the feeling we could be friends! Also, she made me Uninvited was a pretty awesome read! The book doesn't take itself too seriously yet I was still intrigued by the story and mystery. It was even more enjoyable after reading a few darker reads beforehand. I gobbled this light book up, even though I am not always one for the genre. I would recommend Uninvited to anybody looking for a reading vacation. I really enjoyed Ally's narration. For the most part, she is very likable, and very vivid. I have the feeling we could be friends! Also, she made me laugh out loud a lot. Speaking of laughing, my favorite character, Shane, had many comments that had me bursting out in laughter. The witty banter between the two characters was incredibly entertaining. (Note: This is more of a fun, intriguing read than a serious, thriller mystery.) And it is fun watching all the trouble Ally and Val get into as they meddle! Ally's best friend, Val, was an amusing character to add to the cast. She is clumsy, and endearing, and stubborn! (And loyal. Wow. Another adjective.) On another note, I really enjoyed the romance. It was not insta-love! Yes. Also, the couple didn't even kiss in this first book. The fact that the romance was sweet, fun, and realistic earned Uninvited serious bonus points in my book! I really hate it when a book just dives straight into a romance between two characters after a couple chapters and the reader is left behind wondering what on earth happened. The one thing that kind of bothered me was that I felt like most of the people in Ally's clique were not genuinely good people. Are the readers supposed to feel that way? Hmm. You know what? I am not going to think about that now. I enjoyed the book too much. I read the whole book in one sitting. Also, I loved the mystery. I enjoyed picking up clues about what happened to Kristen. The authors seem to have put the perfect dose of fun and mystery into the book. And who doesn't love all the juicy secrets? While I don't really dig the cover of this book, I enjoyed the pages! Alley is starting her senior year of high school at Upper East High, and it's just as it sounds...a school for the wealthy and privileged. Although Alley isn't at all either of those two things. Luckily for her, her best friend Val is one of the popular and therefore she is by default. Expecting a normal year of school until everything changes when Kirsten, head cheerleader, goes missing. Then things go from bad to worse when V While I don't really dig the cover of this book, I enjoyed the pages! Alley is starting her senior year of high school at Upper East High, and it's just as it sounds...a school for the wealthy and privileged. Although Alley isn't at all either of those two things. Luckily for her, her best friend Val is one of the popular and therefore she is by default. Expecting a normal year of school until everything changes when Kirsten, head cheerleader, goes missing. Then things go from bad to worse when Val decides that she can do a better job than the cops and takes on investigating Kirsten's disappearance. Can Alley keep her bff from dragging them into this mess before they become the target? So I want to start by saying that I'm just not a fan of this cover. I don't know why, but it makes me not really want to read the book and after reading it, I can say that I still don't like it all that much. Even still the story is good. It's not exactly what I was expecting, but it was a fun fast read none the less. I was thinking there was going to be a little more romance woven in here than there was. I would lable this as a suspense/crime mystery red more than a romance for those of you that are wondering. Don't get me wrong there is some romance in here, just not very much. The only real problem I had with this book was all the name dropping/label naming that went on. I know that these girls are rich and come from money, but I don't need you to tell me what kind of car Kayla drives over and over again. Or what brand of shoes Val is wearing. There was just a lot of repeating going on in here. When it wasn't about the brands and labels it was about how clumsy Val was. As a reader I understood she was clumsy when you told me the first time, I don't need it blatantly stated over and over again every time she falls throughout the book. Uninvited by Leah Spiegel and Meg Summers is the first of a trilogy. In this book, the protagonist Alley, her best friend Val and her friends Kayla and Libby search for their missing friend Kirsten. First suspect? Shane. The mysterious new student who Libby saw having a mysterious conversation with Kirsten. The new kid the police just do not both to consider as a suspect at all. The antics these four amateur investigators encounter on their search for their friend’s whereabouts are wonderful. At first, I did not like how Alley was so cynical that she viewed her friends as Val friends and her own. But then, I realize she was feeing like she did not belong, a feeling I sometimes felt as a teenager. And as the book strolled along, Alley never was close to Kayla or Libby, but they did have a good time. I liked how all four were their own person. Val is a cheerful klutz who is smart and tenacious. Libby is a bit insecure in regards to her relationship with her boyfriend and reluctant to independently search for Kristen kidnapper. Kayla is funny and caring as she encourages Libby to help with the search. Alley may be fashionably challenged and cynical at times, but she stays true to finding the truth as she does anything for a girl she found unlikeable. All four of them are brave. Shane. Boy, he was clever. I give him lots of love. Shane and Alley’s interactions were delightful making their “not-a-romance” the best relationship in the book. I love how Shane’s feelings toward Alley transformed from amused to annoyed to spiteful to caring to all those feelings at the same time. And how Alley’s feelings towards Shane were annoyed to annoyed to spiteful to liking to crushing all these feelings at the same time. However, what causes this book to rock is the humorous exchanges. The writers have a knack on writing comedic lines. I tried to eat some raspberries while reading and ended up giving up on ever eating (till the book was over). I just could not stop laughing. What type of laughter did I own? The type where I laughed so hard it hurts. The humor reigns in banter that is silly and loveable. “Ah,” he added happily from somewhere in the living room, probably on the leather couch if I had to guess. “This is cozy,” he said, causing me to narrow my eyes suspiciously. Either he was nuts and liked to talk to himself, or he was enjoying himself way, way too much. I had no trouble discovering why the police ignored the Shane posibility. They mystery to who took Kirsten had the surprising results. I mean I did suspect the culprit, but I also suspect many other characters. I am glad the mystery diverges from the typical murder mystery. This book is wonderful. A delightful experience I relived yesterday. Yes, this is a rare mystery that can be re-read because the resolution is not what caused me to love this book. Instead it was the humor, the writing and the characters. I am eager to see what Alley, Val, Kayla, Libby and Shane do next in the second two books of the trilogy. To conclude is a terrific exchange between Alley and my favorite boisterous cop. “I’m doing surveillance,” he cleared his throat and explained. “Of my house?” I tilted my head a fraction as if to say, why? “Yep, Mr. Nadler.” He suddenly grinned. “Just to make sure little boys aren’t going in and out,” he said with a wink. Blurb from I want to thank the authors for providing me with a copy of this book to read and give an honest review. Receiving this book for free has in no way influenced my opinion or review. There are lots of cliques in the school, but there are 2 particular cliques that are always mentioned in the book. There is Val’s clique (Kirsten, Alley, Kayla and Libby) and Taylor’s clique. This book is written in Alley’s perspective and at first, I thought that it was going to be about how Alley struggles being liked by the popular girls. It was mentioned that the only reason why the rest of the girls in Val’s clique hangs out with Alley is that because Val & Alley are best friends. Alley was given “Val’s shadow” as her nickname so I thought this book was definitely going to be about our MC getting bullied. I was wrong and I’m so glad I was! This book was epic and just hilarious! I love, love, loved it! From start to finish, my nose was glued on the text. The writing style was very good; the pacing was smooth and wasn’t choppy at all. First off, a big round of applause for the authors. I could NOT stop laughing (I literally LOL-ed). The characters were just hilarious especially Val! Oh Val (Valerie) I freaking LOVE her personality and all the silly mistakes she made (she pepper sprayed herself xD ). There’s a lot of characters in this book, but you could all tell them apart. The author did an amazing job on giving their characters their own voice. So if you’re worried you’ll get them mixed up, I’m pretty sure you won’t. All of the characters were just witty which I think is one of the reasons why you’ll keep on reading. They are characters you’ll just instantly click with and love. Alley is a senior high school girl and hangs out with a gang of four popular girls, not because she wants to but coz her BFF Val is one of them, "popular bij assocation" is the term that seems appropiate. Kirsten, one of the girls is organizing a sweet 18 Birthday party but doesn't show up for her dressing and seems to have disapeared into thin air. But it did have his funny moments and made me smile about the crazy situations the girls seem to get into. So I was given the opportunity to be part of this tour and I jumped on it because it gave me a chance to read this series again. First off I am a huge fan of Leah Spiegel and Meg Summers. They have a gift at being able to capture the essence of YA, with an elements of funny, serious, relationships and suspense. I totally forgot about how Alley the cute, sarcastic witty girl gets the attention from the bad boy undercover cop. At the same time gets in a world of trouble and shenanigans with her side kick and bff Val. "Honey, Shane likes you," Val said. "I know he's not supposed to. But I think you're the only one who gets him and his jokes because lord knows, I do not." Such a cute story with fun, mishaps, friendship, suspense and the blossoms of new love. When you look at the cover and read the blurb you know what's the first word that came to my mind - silly. It actually was silly at the times, but besides that it was such a funny read that I couldn't stop laughing and not to mention mysterious which I really didn't expect. This is Alley's story. She is a girl attending high school, but she is in a bit unusual company. Her best friends are as cliche as they can be. Spending a lot of money on c This was cute! This is Alley's story. She is a girl attending high school, but she is in a bit unusual company. Her best friends are as cliche as they can be. Spending a lot of money on cloths, make-up, etc while Alley doesn't. But still they create a great group of friends. Everything starts like yet another high school year until one day their friend Kirsten disappears. She acted unusually lately, actually since the new guy in school showed up - Shane. Girls easily fell for his charm, but not Alley. She saw him talking to Kirsten just before she disappeared and that made him number one suspect. It was time for girls to do a private investigation and find out what's Shane hiding and who is he actually. My favorite part of this book were conversations between Shane and Alley. They made me laugh so much and I wanted to hug Alley with every witty word she said. For me she is such a great character and I could easily connect with her. But at the same time Shane is such a great boy and I could easily fall for him. Besides the two of them all secondary characters were great, especially Val, because let's face it we all have that one blonde friend. For people who usually read chick-lit this book might not be as fascinating to them as it was to me, but for me this was actually a really perfect summer-read and it had everything I could ask for. I can't wait to read more of this. I really wanted to read this book. So when I got the chance to read it in exchange for a review, I was thrilled. Unfortunately, my computer kept crashing. Bottom line, I couldn't read it. So I got myself an e-reader and started reading.. The book is about four girls, Alley, Val, Libby and Kayla, who start searching for her friend Kirsten when she suddenly goes missing. Who took Kirsten and why would they take her? Especialy Val takes this way to serious, acting like she's an investigator and all. I really wanted to read this book. So when I got the chance to read it in exchange for a review, I was thrilled. Unfortunately, my computer kept crashing. Bottom line, I couldn't read it. So I got myself an e-reader and started reading.. The book is about four girls, Alley, Val, Libby and Kayla, who start searching for her friend Kirsten when she suddenly goes missing. Who took Kirsten and why would they take her? Especialy Val takes this way to serious, acting like she's an investigator and all. And as the best friend of Val, Alley tries to stop her best friend to do stupid things troughout their adventure. From the beginning all clues point to the handsome new guy, and from here the girls experience all kinds of events, from funny ones to exciting once. Overall I thought the book was good. Every girl had their own personality, which you could very much see in the girls' actions. I really thought Val was exaggeraging much with her behaviour in trying to find Kirsten. Although that was irritating sometimes, that led to funny outcomes. A nice lighthearted read, something get your mind off things. When I read the synopsis of this book I thought it might be a good mystery and expected it to be somewhat like the pretty little liars. Upon reading it I found it to a little different. As much as I liked this novel I still found somethings that may not be everyones cup of tea. I found the insistence on using current celebrities and styles to describe things rather than actual descriptions to be a bit frustrating. For instance if I di A nice lighthearted read, something get your mind off things. As much as I liked this novel I still found somethings that may not be everyones cup of tea. I found the insistence on using current celebrities and styles to describe things rather than actual descriptions to be a bit frustrating. For instance if I did not know who Kellan Lutz was or what Louboutins looked like I would have to look up a lot of these examples to get the gist of what the author was saying. I also found this to be quite dramatic and reminiscent of shows like Laguna Beach and Gossip Girl so Im not sure if its just a coincidence that some of the character names were also the names of people on such shows. While there is nothing wrong with this I did find it hard to make my own ideas of certain characters since I already had these images in my head. It might seem like I didn't enjoy this book but I did, at the same time though I could have put it down at any point and read something else. If you like books like Gossip girl or Pretty little liars then perhaps make this series part of your collection, if you are looking for something with a bit more depth then maybe pass it by. Looking for a fun way to spend a day or two or three? Look no further, Uninvited is the perfect fluffy entertainment and you won’t be sorry you decided to hang out with Alley and her pals. One of the oddities (to me) that I’ve noticed in contemporary young adult fiction is the repetition of certain stereotypical behaviors, most notably that the popular girls must also be mean girls. I’m happy to say that Ms. Spiegel and Ms. Summers have avoided that trap and these four are actually pretty nice to Looking for a fun way to spend a day or two or three? Look no further, Uninvited is the perfect fluffy entertainment and you won’t be sorry you decided to hang out with Alley and her pals. One of the oddities (to me) that I’ve noticed in contemporary young adult fiction is the repetition of certain stereotypical behaviors, most notably that the popular girls must also be mean girls. I’m happy to say that Ms. Spiegel and Ms. Summers have avoided that trap and these four are actually pretty nice to their classmates. They might very well be one of the top cliques in school, they’re attractive and three of the four have more money than any teenager needs but they’re also amusing, intelligent and, in the case of Val, refreshingly uncoordinated. Val reminds me of a dear friend from the past who was strikingly attractive and yet likely to fall flat on her rear or her face at any moment. As a fan of mysteries, I thoroughly enjoyed watching Alley and the others turn into modern-day Nancy Drews when their friend goes missing and their attempts at sleuthing had me smiling all the way. I was actually pretty sorry to come to the end because I was having such a good time but, happily, there are two more books in the trilogy so Alley, Val, Kayla and Libby can draw me back into their adventures. I’m off to find Confiscated and Compromised right now. Alley is a 17 year old girl attending high school with a normal house, normal car and a simple closet unlike all the girls and boys at Upper East High. On her first week back to school she meets Shane, a really good looking new student and soon starts to learn thing about him as one of her friends despairs and her best friend Val decides to take it in her own hands to investigate the mystery behind her kidnap and the relation with the new guy. She gets into a whole lot of trouble for trying to bac Alley is a 17 year old girl attending high school with a normal house, normal car and a simple closet unlike all the girls and boys at Upper East High. She gets into a whole lot of trouble for trying to back up her BFF and keep her from getting arrested. The South Hills Sidekicks is a really entertaining saga, Val can either make you laugh or make you want to shock her to dead, Alley tries to keep up with her and Kayla and Libby are so on for the ride, either to the clothing store, restaurant or wherever it is the person in turn they are following is heading. I loved this girls so much I already read the next 2 books and I'm waiting for book 4. I gave this book 2 stars, because according to the ratings of Goodreads, that means "it was ok", and that's what I thought of it. I had to push through this to give a review, and it was not the author's fault. This just isn't my type of book I guess. It wasn't written poorly at all, and the story made sense and it would be a fun book I suppose if I was in high school or middle school, but I'm not. I probably should've passed on it in the first place, but since I read it I will review it. Personal I gave this book 2 stars, because according to the ratings of Goodreads, that means "it was ok", and that's what I thought of it. Personally I found it shallow and predictable, but it suits the genre and subject matter. I usually prefer books with a little more substance to them. If you like drama, high school, and all that jazz then you'll probably love this. It kind of reminded me of the Sweet Valley High books that I read when I was younger. I just don't seem to tire of the whole high school girly, clique theme. Alley and Val are best friends who keep getting in the way of the investigation while trying to solve the crime of their friend who has disappeared. I loved Val, she's determined, loyal and pretty clumsy. I can relate to that! She's definitely the comic relief while she's trying to solve the crime, or just make it to school for that matter, in her Jimmy Choos. There are of course hot guys and a love interest for Alley which I just don't seem to tire of the whole high school girly, clique theme. Alley and Val are best friends who keep getting in the way of the investigation while trying to solve the crime of their friend who has disappeared. I loved Val, she's determined, loyal and pretty clumsy. I can relate to that! She's definitely the comic relief while she's trying to solve the crime, or just make it to school for that matter, in her Jimmy Choos. There are of course hot guys and a love interest for Alley which is why I want to get to the next book ASAP! I can't say too much as it is a whodunit genre. I thought it was a well written, quick and fun read. Thank you Leah, you'll be hearing from me again! First off, I would like to thank Shut Up And Read for providing me with this book to read. I'm highly grateful. Coming to the book, I started it a couple of days ago just after I finished reading and reviewing another ARC ebook, which I didn't enjoy at all. So coming into this book, I was a little tentative cuz I did not want to end up disappointing myself, and I guess the end result is sort of - neutral. Two stars. It wasn't amazing enough for me to like it, but it wasn't that bad either. I'm not First off, I would like to thank Shut Up And Read for providing me with this book to read. I'm highly grateful. Oh, I really liked this! I knew who he was well before it was revealed, but it didn't ruin the story at all. I didn't know who the 'bad guy' was for quite a while which was great, and there was lots of fun in between. Stupid teenagers and their stupid choices, and two people falling in love who aren't allowed to. Changed to 5 stars. My criteria for 5 stars is simple, will I read it more than once? If the answer is yes, then it's up to 5 stars. I read it again, so I upped it. (This review can be found on my blog The (Mis)Adventures of a Twenty-Something Year Old Girl). I loved this book!! It was cute, thrilling, and super interesting. The blurb definitely had me intrigued, and I'm glad that I was able to read this book. So I'm not going to bore you with going over what the blurb's about since the official blurb is pretty spot on. For some reason, the title reminded me of a ghost story even though the cover says otherwise. I don't really get the title. I guess it's beca (This review can be found on my blog The (Mis)Adventures of a Twenty-Something Year Old Girl). For some reason, the title reminded me of a ghost story even though the cover says otherwise. I don't really get the title. I guess it's because there are parties involved in the book. When I first saw the cover, I thought this was going to be a chick-lit book, not a YA book. The cover is definitely cute and different to what covers normally look like. I do like it a lot though. I enjoyed the world building although there were a few things that seemed off. (view spoiler)[For example, there's an undercover cop at the girls' school. When this cop becomes friendly with one of the girls, he tells her information on the case that I don't think a cop would be able to divulge. While he didn't tell her everything about the case, there was some info that I thought would probably be enough to get him fired. There's also a part in the story when the undercover cop takes out the spark plugs in one of the character's cars. Personally, I thought that would be illegal which a cop wouldn't do. (hide spoiler)]One more small thing that bothered me as the fact that the character didn't know what spark plugs were yet she knew what a certain type of wrench was. Other then those things, I quite liked the world building and found myself immersed in Alley's world. The pacing was fantastic. I'm not going to lie. I thought this book would be all over the place pacing wise, but I couldn't have been more wrong. Each scene flows naturally into the next, and it's such an easy read. I couldn't wait to see what would happen next. I enjoyed the whole mystery plot. While some of the plot twists were predictable, the plot stays interesting. I was desperate to find out who had taken Kirsten. All of the characters felt like real life people except the character of Val. Val, to me, felt too ditzy to be real. Personally, I've never come across someone as spacey as Val. There were times in the book where she'd be in situations where it seemed no common sense was required, but she'd still make a mess of it. Maybe these uber ditzy girls do exist, but I've yet to come across one. I loved the character of Alley. She was so down to Earth and just came across as your average every day teenage girl. She felt like someone I could relate to and felt the most real out of all the characters. While Kayla and Libby were written well, I just wish that there would've been more information about them. I felt that there personalities didn't really get to shine through fully. I did like Shane as well, but I just wished he wasn't so moody. He does get better in the book, but I wish he would've treated Alley a bit nicer. Buddy the dog so cute in the book! I definitely enjoyed the dialogue, and a lot of the time, I as laughing with the girls. Their banter came across really well and didn't seem too grown up or too young for their age. I don't really remember any swearing in this book. There are slight drug references, although there's no one drug referenced. Overall, Uninvited is a cute and super fun read. It'll will definitely keep its audience hooked from the first page as they try to figure out the mystery. I'd recommend this book to those aged 14+ who want something fun and lighthearted to read. 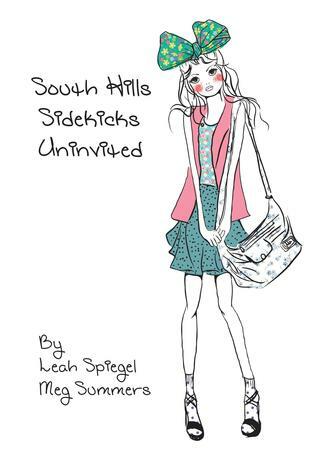 I'd give Uninvited (South Hills Sidekicks #1) by Leah Spiegel and Meg Summers a 4.5 out of 5. Do you need anymore reasons to read this book? I've always wondered, you know, how it would be to write a book along with another person. Obviously, you'll have double the talent and you could split the workload (maybe? I'm not sure) and stuff, but what about the little disagreements that are bound to pop up? You'd have to take another person's opinion into account, and I always wonder how that would work out. Would it affect the quality of the writing? Well, I got my answer to that last question. Uninvited was simply amazing! Maybe it was because I'd read a book along these lines after so long, but it just struck a chord within me, with something I hadn't realised I'd been missing all this while. The writing style used in the book is seamless and really brings out the best in each character. I loved that - how each character was projected the best possible way (do note, I dont mean in a positive way). Alley is a kid with a dry sense of humour, zero fashion consciousness (which is unfortunate since she hangs out with the 'it' girls), and is pretty well grounded for a teenager. Well, mostly, that is. Her best friend, Val, is the complete opposite. A klutz of the highest degree, she's also sweet and slightly feather brained, though everything she does, she doe with a good intention. Oh, and she's gotta be given high points for being the first one to spot the trouble. One day, soon after school reopens, their friend Kirsten goes missing. No one has any clue where she is, but they know it's definitely not of her own volition, since there's no way she would miss precious little 'Sweet 18' birthday party! Logic points towards the new kid in school who seemed weirdly close to Kirsten - Shane. He may be good-looking, but he's just as annoying and sarcastic. Naming him as a suspect to the police brings no results, so the girls (Alley, Val, Kayla, and Libby) take things into their own hands and turn investigators. Shane's back story holds up, but only barely. There's something very fishy about the guy. For starters, why does he live alone? The girls 'investigation' makes for some very funny reading, filled with blunders and getting into trouble at every turn. There were so many times I just couldn't hold my laughter in! But soon, things get serious, when they find out that the culprit is probably one of their friends. Shane makes for a very intriguing character. I wouldn't say there's no one like him in the book world, but the way the authors have fleshed him out worked very well with the entire feel of the story. The chemistry between Alley and Shane is simply off the charts, and it's hilarious how they try to annoy each other to no end! Shane can be ruthless if he wants, but later in the book we see him mellow down a bit, and it was nice to see that side of him as well. I do wish there was more about him in the book though; I really liked him. The secondary characters in the book are also very entertaining. I liked how the authors gave each of them distinct characters and mannerisms, despite them being only secondary characters, because I see that flaw in a lot of books. The story has equal parts mystery and humour, so even though it touches on some serious topics, it's still great for light reading. Bottomline: Filled with humour, intrigue and some amazing verbal footwork (is there even a phrase? ), this book will take you back to high school! I must admit one of the first things that got my attention was this book's super-cute cover. What can I say? It's something we all do, even some wouldn't admit it. Reading the plot summary, I thought it would be a fun read - and it was: a perfect summer read for me. So I was pretty excited when my book arrived, signed by both authors, who are sisters, and started reading it as soon as I finished with my exams and came home from my holiday out of town. Initially, I was a bit disappointed. There were kind of more typos than I like to see in my books, but the funny thing is that after a few tens of pages, the typos became inexistent. And not just because I was super into the story, but the book was probably more carefully edited from then on. Now the plot may seem similar to Sara Shepard's Pretty Little Liars. At least that's what I thought ar first. We have the missing teenage girl and her friends trying to play detective and find her. And I must say, I admire their friendship. Not many people would break the law like that and risk getting expelled or worse, arrested, just to make sure their friend is safe. The characters are typical teenage girls. The protagonist is Alley, a simple girl with a good sense of humour, who ends up being in the most popular clique at highschool because she's Val's best friend. While I loved Alley, I have mixed feelings for Val. It just seemed a little odd someone so klutzy and... dumb, would be so popular. The most popular girl position is occupied by Kristen - the girl who goes missing. And, typically, her friends think Shane - the new guy - is guilty for her disappearance. Alley also thinks she's being followed by him, but the police claim he has a strong alibi. And you will have an amazing surprise when you find out who he actually is! So... who's actually behind Val's disappearance? And who's dealing drugs? The two cases are somehow connected. I love this kind of investigation stories, where teens try to find out the culprit, but, unfortunately, I guessed who was the guilty one right from the beggining. Even so, the book is a very fun read. I really enjoyed Alley's and Shane's hilarious conversations. The chemistry between the two is glowing right from the moment they meet. I'm really curious how their taboo relationship will develop later in the series. And while I'm reluctant to start new book series, I'm glad this book has a clear ending, independent of the rest of the series. So you can read "Uninvited" without fearing you won't keep up with your other series. Another character I liked reading about was Alley's dog, Buddy. The two are like a comic duo, with Buddy's behaviour and Alley's inability to make him obey. You will explore Alley's life as she tries to find her place in a group of girls that only accepted her because of her friendship with Val, and not of her personality, and at the same time save your friend. At first glance a typical teenager story, "Uninvited" is more than that. It's a sweet story about friendship, devotion and trust, with a comedy topping. A perfect read for a summer day or when a moment you are in need of some cheering up and relaxation. For me, it was great to read about the period of my life that just ended a few months ago - highschool. Big thanks to Leah and Meg for providing me with this book. I had a blast reading this. It was a teenage Nancy Drew in thousand dollar heels and the effect was adventurous, funny, and kind of cute. I do like the cover but I really thought I would have to deal with some grade-A bitchiness, but that wasn't the case. Yes, the girls are rich (with the exception of the main character), they were all extremely likable and a lot of fun. Our main character Alley is your typical teenage girl except for her friends and her school. She is surrounded by the rich and the popular. Her best friend Val is one of the most popular girls in school, so Alley is indirectly in the know. One day Alley and the gang have to help a friend named Kirsten with her wardrobe for her huge birthday bash. Problem is, everyone shows up except for Kristen. They soon find out Kristen may be in trouble and the new guy Shane may have something to do with her kidnapping. So Alley and her friends are out investigating for themselves. The main character Alley was great. I related to her the most. She knew who she was and was very mature. Given that her dad is barely in the picture, she pretty much raises herself. Her best friend Val was a favorite. She looks like a supermodel and wears high heels even though she is quite the klutz. When we first meet her, we find out just how uncoordinated she is. But she is a great friend. She was the first to figure out there was something wrong with Kirsten and she didn't stop until she got to the bottom of it. She does have her blonde moments and they will make you laugh, but she was relentless. I liked their other friends Libby and Kayla as well. But out of all of them, Libby worried me the most. She was a bit of a doormat when it came to her near nonexistent boyfriend Nate. She just couldn't see it. I really enjoyed this story a lot. I love the mystery built around the new guy Shane. He comes to the school and thinks a bit too highly of himself. The girls notice him arguing with Kirsten the day she disappeared, so the girls are on high alert. I love how they chase him to see if he has Kirsten. But Alley for some reason is crushing on him and soon realizes he may not be the one that took Kirsten, but someone close to them may have. Don't really have any complaints. I did put some things together way before they were revealed. But that doesn't take away from the story at all. I had a lot fun following these characters. There really wasn't a dull moment with these girls especially with Val. Like I said, she was relentless. Thank you to Giselle of Xpresso Book Tours and the authors for the review copy. Having received a review copy did not affect my views of the novel. Uninvited is classified as a "humorous YA chick-lit" and with the blurb saying that their friend has disappeared and that she's in danger and it's up to them to find her, I expected this to be an antic-filled, breezy mystery novel. And I didn't get any of those. Where was the humor? Oh yeah, right past the middle and I only laughed because I got numb of the dumbness and I figured that I should find joy in it or else I will be frustrated the whole time. I am really sorry if I sound mean but I guess my humor doesn't appreciate it when a person keeps on wearing high heels even if she knows she keeps on tripping. I know all about fashion over comfort but did Val really have to fall down that much? Once or twice would be fine to establish that she isn't exactly a creature of balance but for it to happen all the time annoyed me. Sorry if I sound shallow but it was really a sore point for me. I did not only not like Val but none of the characters made an impact on me. Truth be told, I can't remember their names anymore and I REMEMBER names. That's one thing I can do. If I don't remember the name of the character a month after I read a novel, it's a clear indication that it didn't register. All I remember is that the main character (Oh, apparently, her name is Alley. Thanks, blurb!) was a beta heroine. Now, I love beta characters normally because they're cute and lovable but in here, her beta-ness was not endearing. Her friends had more personality than her, which isn't good. If I don't get a fantastic plot (which I didn't get), I need at least terrific characters who can make the novel engaging for me. Sadly, I didn't get that as well. As for the plot, I think the mystery in here was half-baked. It was predictable although I did not expect the major twist on the new guy Shane. I do give props because I didn't think of that, probably because I lowered my expectations. Once the secret was out, everything came back to being predictable as well. The romance or more like, attraction, between Alley and Shane was only established since it's the first book (oh gah), which felt realistic. Whew for no insta-love. I actually kind of liked how awkward/cute they were and that the authors only hinted about their future romance. Kids! However, I do expect their romance to bloom in the next crimes or mysteries they'll solve aka the next books. Would I read the sequel? No, although I do want to see and read about the progression of Alley and Shane's relationship. However, I don't think I can stick through with more of the not-so-amusing antics, useless scenes (they were rampant) and humor I don't appreciate. I absolutely adored this book and the beginning to the South Hills Sidekicks series. It was such fun and the characters were so fantastic that I couldn’t put it down. I had a little trepidation when I went to start the book, but as soon as I turned the first page I was hooked on the fun and unique world that these two wonderful ladies have created. The style of writing they have attributed to Uninvited was fabulous and like so funny. Alley has started her senior year at Upper East High with her b I absolutely adored this book and the beginning to the South Hills Sidekicks series. It was such fun and the characters were so fantastic that I couldn’t put it down. I had a little trepidation when I went to start the book, but as soon as I turned the first page I was hooked on the fun and unique world that these two wonderful ladies have created. The style of writing they have attributed to Uninvited was fabulous and like so funny. Alley has started her senior year at Upper East High with her best friend since grade 3, Val. Since Val is in with the popular clique, Alley is automatically included as well. The rest of the group includes Kirsten the Queen, Kayla and Libby, plus a bunch of boyfriends. First day and Kirsten introduces the group to a newbie, Shane. It is quite unusual for a new kid to be included in the popular group, but Kirsten knows him from somewhere or other and gives him the recommendation to join them. Kirsten was turning eighteen and planning to have a big party to celebrate, that afternoon, the girls were going dress shopping to help Kirsten find a dress for her party. Everybody turned up at the dress shop except Kirsten. Something is wrong, Kirsten isn’t answering her phone and nobody seems to know where she is. The girls just assume she is with her boyfriend and will talk to her tomorrow. Tomorrow it is confirmed, Kirsten is missing. She didn’t turn up for school and didn’t go home last night; her car is still in the school parking lot. Now Val is extremely upset as are the rest of the group and after speaking with the police, they hope she is found soon. Val and Alley have some suspicions about Shane being behind the kidnapping. He turns up the day Kirsten disappeared and they were acting a little weird at lunch, something just seems off with Shane. Val is determined to get to the bottom of it, when the police seem to push their ideas out the window. Val is scheming and has decided that the girls will help her uncover Shane’s secret and find Kirsten. Val is known as a ditzy klutz and nobody seems to be taking her very seriously, but the girls follow along with her plans and get themselves into all sorts of mischief. The police seem to think it could be somebody at school and this puts more suspicion on Shane. Will they really be able to find Kirsten? What is Shane’s secret? Is there something going on between Shane and Alley? Are the alibi’s true for the group’s boyfriends on that night? Everything comes to a head when Val decides to have a party. Follow along with Val, Alley, Libby and Kayla as they try to solve the mystery of their missing friend. It is a lot of fun and I was laughing out loud quite a lot with the humorous outbursts from Alley towards Shane. I loved this book so much that afterwards I had to grab book 2, Confiscated and 3, Compromised so I can find out what antics the group get up to next. This is definitely a favourite of mine for this year. I highly recommend to all young adult readers that are looking for a light hearted, fun and intriguing read. I have liked Leah Spiegel since her book "Foolish Games". However, I hesitated to buy this book because not many people rated this series in Goodreads. I am wary to add books with high ratings but few raters. This means that the high ratings have not been widely proven. But, this book totally rise up to my expectation and even catch me off guard making me laugh like loons while reading. Alley is a sensible, witty, and intelligent girl. She's one of the girl in the popular group even though only d I have liked Leah Spiegel since her book "Foolish Games". However, I hesitated to buy this book because not many people rated this series in Goodreads. I am wary to add books with high ratings but few raters. This means that the high ratings have not been widely proven. Alley is a sensible, witty, and intelligent girl. She's one of the girl in the popular group even though only due to association. The true popular girl is the glamorous Val, Alley's BFF. Alley was never comfortable in the group and detested the others' major fascination with clothes and the whole notion of popularity. She also believes that the others in the clique like Kristen, Libby or Kayla just bear with her because of Val. Does this description sound familiar??? It sounds like the usual 'Mean Girls' story, right? Well, the story plot didn't just end there. It went off tangent into mystery, hilarity, and fun adventure. Let me describe how the mystery starts. Kristen, the queen bee of this clique, suddenly went missing before her sweet 18 birthday party. After days of no news, Val decided that they need to take this matter into their own hands and search for Kristen. Dragging Alley, Libby, and Kayla along into escapades. Their suspicion fell to Shane, the hot transfer student whose background story is full of inconsistencies and lies. And he was the last person they saw talking to Kristen!! Now, how does this mystery become hilarious? To understand this let me describe Val. Val is this blond gorgeous goddess with a tendency to get into accident due to her clumsiness. People would describe her as ditzy. But, this doesn't mean she's not intelligent or shrewd. She's just marching to her own beat which can be illogical to the rest of normal people. What makes sense to Val can be insane in usual people's standard. Alley is the voice of reason to Val. The one who tries to reign Val and minimize the mess Val has started, and gets everyone out safely from the adventures Val has dragged them to. All the escapades are silly and just hilarious. Imagine 4 amateur detectives blundering around. Of course, 3 of them blundering around with high level of embarrassment as they know they looked silly doing it. If it's just stop at being hilarious, I might love it but I may not give it a 5-star. I gave it a 5-star because I fell in love with all the characters. Alley and Val of course. I also fell in love with Libby, Kayla, and Shane. Libby and Kayla prove themselves more than just some snob girls. They are brave, loyal, and unique in their own way. Shane is this sarcastic alpha male type. The conversation between him and Alley is always full of chemistry and witty banter. In his action though, he's proven to be kind and he has great sense of humor. I like this book. I definitely didn't regret my decision to buy it. I'll start to read the second book soon. I have to begin by saying that I first fell head-over-heels in love with Leah Spiegel’s writing when I read Foolish Games. This lady has an amazing way with story telling and bringing the characters and story to life effortlessly. She also has an amazing talent with the Young Adult genre and no matter what your age, you will quickly become engulfed within that tingle of first love. Uninvited is the first book in the South Hills Sidekicks trilogy. When I first began reading, I was reminded a bit o I have to begin by saying that I first fell head-over-heels in love with Leah Spiegel’s writing when I read Foolish Games. This lady has an amazing way with story telling and bringing the characters and story to life effortlessly. She also has an amazing talent with the Young Adult genre and no matter what your age, you will quickly become engulfed within that tingle of first love. Uninvited is the first book in the South Hills Sidekicks trilogy. When I first began reading, I was reminded a bit of the television series Pretty Little Liars (I know, this is also a book series, however I have not read the books yet, just watched the tv show, so can’t compare to the books, lol). There is a group of friends: Val, Kayla, Libby, Alley and Kirsten. Alley is basically a friend by association – meaning she is Val’s best friend and since Val is one of the “important” people, Alley gets to be in the “popular” group at school. In any case, Kirsten is the ring leader and when she suddenly goes missing, all heck breaks loose and her friends will stop at nothing to discover what happened to her – even if it means putting their lives in danger. The characters in Uninvited are absolutely awesome. Each one has such a unique personality and are so “real” that is it as though they are people you have met. Val is an absolute hoot. She comes off as a bit ditzy, though she means well. She is the one who really pushes for the girls’ investigation into Kirsten’s disappearance. Needless to say, she gets the girls into quite a few predicaments. Alley is the main character and I couldn’t help but connect with her instantly. She basically raises herself after the death of her mother, as her father drowns himself in his work. Alley is her own person and is very straight-forward, stubborn and courageous. When Shane pops into the picture, Alley’s life takes a spin-dive into unknown territory. Who is Shane? He is the hot guy who suddenly appears at the girls’ school. He is seen talking with Kirsten before her disappearance and the girls are sure that he is somehow connected. What they discover, however, is something that truly shocks each one! An Edinboro University of Pennsylvania Graduate who once spent years drawing imaginary worlds and now writes about them with her sister, Megan Summers.